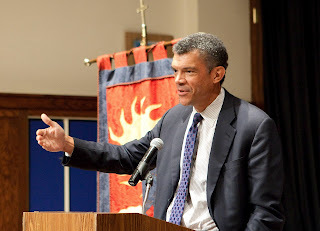 On a hot and humid late spring evening, Mark Whitaker, author of "My Long Trip Home" and Executive Vice President and Managing Editor of CNN Worldwide, visited Saint David's School to talk about his book and relate it to this year's school-wide theme: Rigorous Pursuit, and our school's mission. Whitaker's poignant words and moving story, delivered with a relaxed sense of purpose, were inspirational. His frank, balanced, and at times very emotional re-telling of the story resonated deeply with all present. 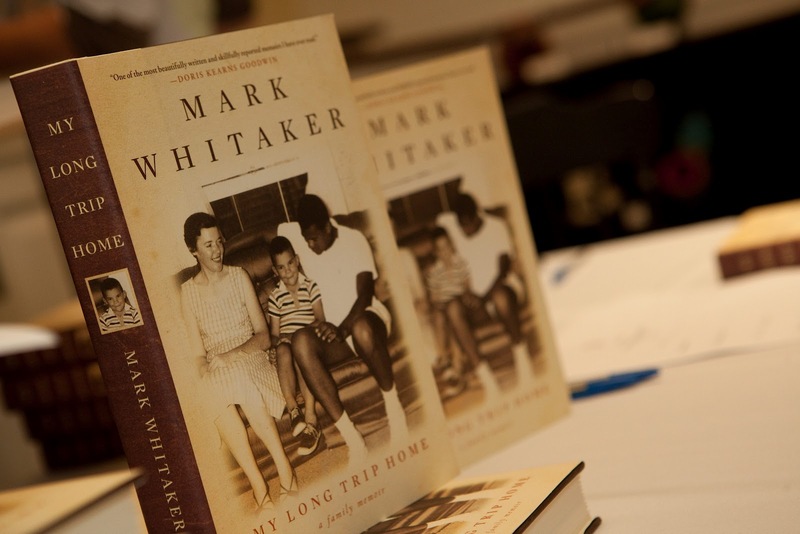 Mark's struggle to find his identity in many respects: racially, religiously, as a child of divorced parents, and in wanting to be a good parent are universal struggles. Questions asked buy members of the audience after Mark's talk reflected this. “Interestingly," Mark commented at one point towards the end of his talk, "the stuff I was ashamed of [in my story] is what people are really interested in; that is what is relatable, as opposed to the exotic/romantic narrative of my parents as a bi-racial couple. I discovered that what you see in a story like this depends on who you are--different people respond differently to the characters." "I wouldn’t wish my childhood on anyone; but I learned resilience, stoicism. As a defense, I became a bit of an observer, which probably led to my career in journalism. I wanted to have a family and make it work." In speaking directly to this year's school-wide theme, Mark expressed being convinced that it is the adversity and setbacks in life that make you stronger, that build your character. Parents, he said always want to naturally protect their children from these; but they can be the avenues to discovery, learning, and strength. Mark Whitaker's visit was sponsored by the Saint David's Committee on Community, chaired by Mill Harris and Sally Connolly. Mark's visit Wednesday night was made possible through the generosity of Dorothy Faux, Co-chair of the Saint David's School Alumni Parents Council.